Happy Monday everyone! (I know happy and Monday don't usually go together but bear with me). 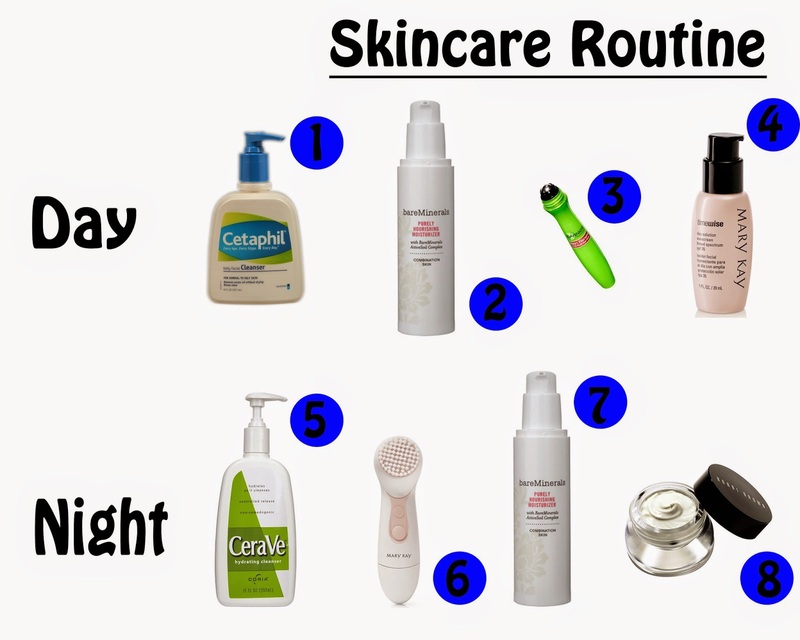 Today I'm sharing with you my daily and nightly skincare routines. I am religious with these two routines, and with the products in them. I feel that my skin has different needs during the day versus the night so after several years I have come up with what I feel are the perfect routines to keep my skin looking its best. Enjoy! 1. Cetaphil Skin Cleanser: I know most of you are shaking your heads at this point and wondering how I could be using drugstore skin cleanser. However I have to tell you that every dermatologist I have ever seen has recommended this and CeraVe as the only skin cleansers I need to be using. It's so lightweight, and makes my skin feel super clean and moisturized. And it comes in a huge container for $10. As with any new cleanser if you switch to Cetaphil you will most likely breakout for a few weeks as your skin gets used to a new product. However once your skin adjusts to it, it will start glowing! Try it out! 2. Bare Minerals Purely Nourishing Moisturizer-Combination Skin: I've been using this product since it first came out and it rocks. It has a great creamy texture, and I can feel it seeping into my skin and moisturizing it. I have noticed a huge difference in my skin's moisture level since I have started using it. 3. Garnier Skin Renew Anti-Puff Eye Roller: Danica talked briefly about this product in her skincare post, but as she was in the initial stages of trying it, I thought I would talk about it. I have been using this product for 2 years and I love it! I roll this under my eyes every morning and I swear within a few minutes I can see my eyes improving. It contains caffeine which helps to give my eyes a more awake appearance. The best part of this product is that it's super cheap and lasts forever. It's a definite must-try. 4. Mary Kay Timewise Day Solution: 1) I am terrified of sun damage on my face. 2) This product alleviates that terror. I love this day solution because I really feel that the sunscreen in it works very well, and it provides an extra layer of moisture for my face. On days where I forget to put sunscreen on the rest of my body, and I end up looking like a lobster, I can always count on my face still looking like it hasn't gotten any sun. You can purchase it here. 5. CeraVe Hydrating Cleanser: I use CeraVe as my nightly cleanser because it releases ceramides and other essential ingredients throughout the night, so they penetrate deep into my skin to hydrate and nourish. It also contains hyaluronic acid (a humectant), which attracts moisture to the top layer of the skin, ensuring skin remains hydrated after washing. I feel that it does a great job of rebooting my skin after a long day where my skin has been exposed to pollutants and covered in makeup. I first use it with a washcloth, and then I apply it a second time where I use the Skinvigorate brush to push it into my pores. 6. Skinvigorate Cleansing Brush: Danica already raved about this brush, and I'll continue with the raving. This brush has made such a difference in the appearance of my skin. I have used the Clarisonic and the Skinvigorate and I promise you are not losing anything but the expensive price tag by buying the Skinvigorate. 7. Bare Minerals Purely Nourishing Moisturizer-Combination Skin: See explanation in No. 2. 8. Bobbie Brown Firming Eye Cream: Nordstrom's beauty department gives out free samples of whatever product you want to try. They give you enough to try a product through an entire skin cycle, which really helps you to decide what product is best for you. A few months ago I went in and requested several different eyecreams including La Mer's. The Bobbie Brown one was by far my favorite. The skin around your eye starts to immediately feel firmer upon application and by the end of my month trial I could definitely feel and see a difference in my eye elasticity. It's a little pricey, coming in at $70, but it will last a very long time, and I feel like the prevention of eye wrinkles makes the price tag worth it. We've got a special treat coming your way tomorrow! Have a great rest of the day!